Please note, any banner ads that you see at the top & bottom of the forum are placed there, not by us, but by our host Proboards. Therefore neither the items advertised, or the vendors, are endorsed by this forum. Promoting, Campaigning, News Articles & Vaping Media. Today we are going to raise the bar a little, as a few people have asked me about tobacco mixes. I have found very little that you can buy, either pre mixed (ready to vape) or even in concentrate form that "hits the spot" or works for me…. So I make my own tobacco extract. I am not advocating that this is what everyone should do, you may have a tobacco flavour you like, and if so that is good… But, this is what I do, if you like tinkering, and have the aptitude, then maybe you can have some really good results as well, and be proud that you really have designed your own personal vape juice. I will explain all…. But, first let me wet your appetite, by sharing with you my “No1 all time Top favourite Tobacco recipe”. A truly lovely vape, that I can’t go long without returning to, and it even has it’s very own DID tank dedicated for it. Just look at those costs…. Good value, but for me, the recipe, is so good because of the subtle flavour of my Home Made “Flu Cured” extracted Tobacco concentrate. This has been a long time in development, finding the best way of getting the flavours from the natural untreated whole tobacco leaf. First you are going to need a source for the tobacco leaf….. They do a “tester pack” for £1.50 inc P&P, it is so good value it is unbelievable, you can turn this into about 125ml of Tobacco concentrate. The pic below is about 50% of what you get in a £1.50 tester pack (I already used half of my last tester pack, so only had this left). So, the next step is to make the extraction… There are many ways of doing it, but this one works for me. 2. Place them in a Pyrex jug along with some VG, just enough to wet them, and cover the leaves (about 50ml when I do it, but it varies) the leaves will soak up the juice. 3. Add about 10% (5ml) of PG and 15% (8ml) of Vodka. The alcohol helps the extraction process. 4. Squish and squash and then let soak for 30 mins, top up with VG if required to just cover the leaves. 5. Boil some water in a pan and put the jug in it (I think this is called a Ban-Marie). Heat the juice in the jug but don’t let the juice boil… That is very important. Stir and squish and squash the leaves during this process. Heat this way for 10 mins. 6. Take the Jug, with the yucky coloured liquid and leaves, let it cool and then cover with cling film. 7. Put it aside and let it steep for 24 hours. 8. Repeat the process above adding a little more VG if required. 9. After the second cooking, whilst still warm, filter into a container. (I use a mesh strainer first with a coffee filter and then push the juice through a syringe with some cotton wool pad in the bottom of it a few times). This is a bit messy, but so be it. 10. You should have about 50 or 60 mls of concentrate now. Put it away somewhere cool and dark and let it steep and mature for a few days. 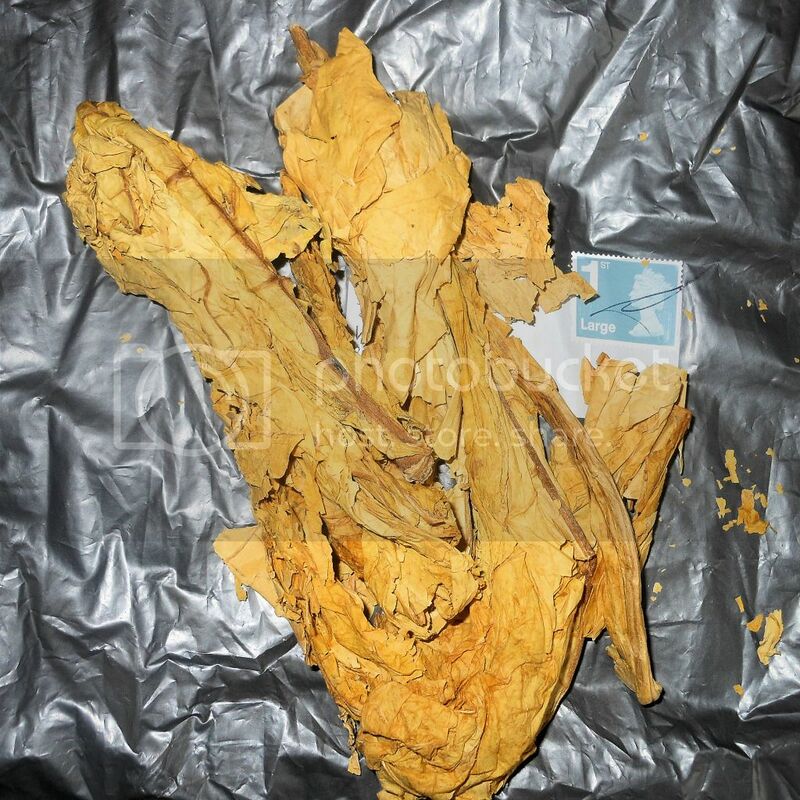 That’s it, you have some Extracted Tobacco Concentrate, granted not as strong as some you can buy as they use a distilling process, but with a very nice tobacco flavour, and all natural. I use my concentrate at about 20% in most mixes with 5 to 10% of other flavours added to it, or at about 25 to 30% on it’s own. When calculating the VG/PG ratios in your mix, don’t forget that the tobacco extract concentrate will be around a 95%VG / 5%PG, the alcohol evaporates away with heating. A bit of effort is required, along with patience, but very rewarding. I hope that some of you give it a try, and report back. Its so good to have an enthusiastic mixer on here. No, it just extracts the flavour... (if any nic comes over, it will be very very minimal - not worth mentioning, or thinking about). To extract the Nicotine from tobacco, you would have to use a solvent to break down the plant mater, and then a solvent reactor to remove the solvent used, then high temp or sub zero temp reduction and finally distil the resulting liquid. I am sure there are methods posted on the internet, but, IMHO it is outside the realms of what we can safely do / should do at home, and to be honest, I wouldn't feel comfortable advising anyone on the use of solvents. The method I have suggested is a mild process and just extracts the flavour, as in a tincture. The juice may cause the coils of your atty to clog up quicker than normal, this is normal occurrence, I think it because The method of filtration is a bit "Heath Robinson" unlike professional filtration processes. There are still a number of microscopic particles in the juice, and they don’t easily vaperise, leaving them stuck to the coil. Maybe it is this that helps give it a "real tobacco taste", anyhow, don't worry about it, just do a dryburn of your coil and it will burn off and be all good to go again. Was chatting with Tim, who makes his own organic juices, (Triphammer), on Friday night. He says he filters his tobacco through 10 times, through ever finer filters each time. He states it takes forever to filter through, but the result is clearer each time, which does make sense. I think he uses something like coffee filters. Would that make sense? Yep that makes perfect sense... I do it three or four times (to be honest I can't be arsed doing it any more than that), being a VG base it is thick as well, so I warm it for a sec in the microwave before each filter to make it filter quicker.... but he is correct.... it takes an age through the very fine filters. Thats why I push it through using some filteration material in the bottom of a 10ml syringe and then force it through, cleaning the resulting gunk off the filter medium when it gets too hard to push anymore. 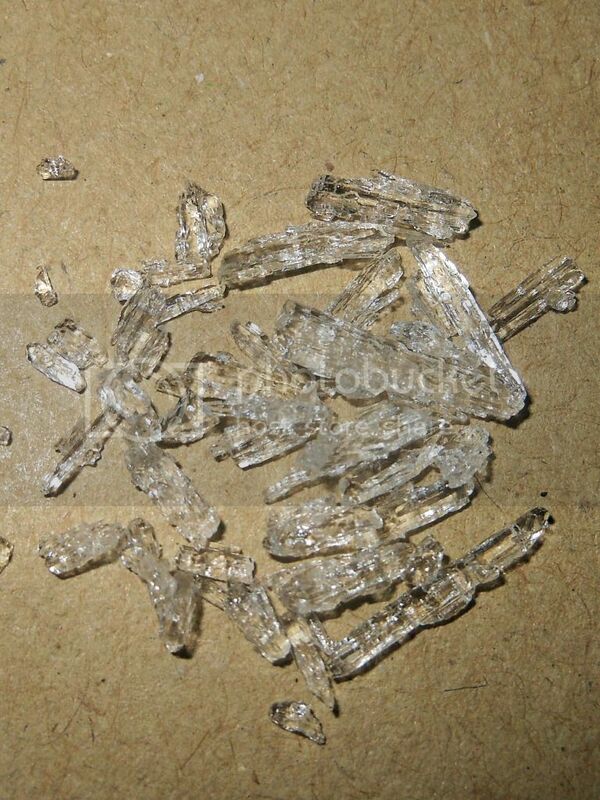 Johnboy asked how to make menthol concentrate from crystals, here is my method (there may be others, but this works for me)… It is a very quick and easy project. 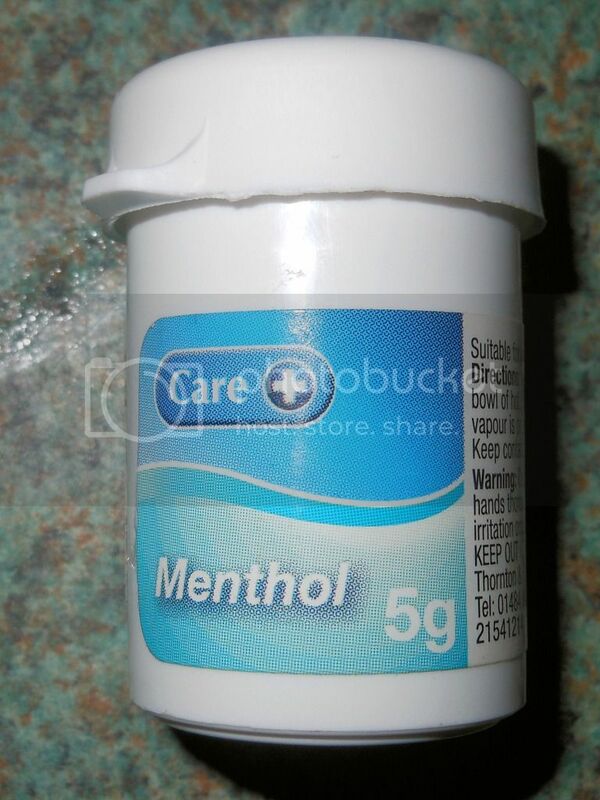 Most pharmacies will sell little 5gr tubs of menthol crystals like the one in the pic below, relatively cheap, about £1.50 or less, and will last a long time. 1. Scoop up some crystals and add them to an empty 10ml bottle, up to about half way. The crystals are very strong and small…. Be careful, and wipe down any surfaces after preparation. Use vary sparingly until you understand how strong this concentrate is…. If not strong enough, you can always add some more crystals. Please note, any banner ads that you see at the top & bottom of the forum are placed there by our hosts, Proboards. Therefore the items advertised are not endorsed by the forum.